Winnebago Industries (WGO) has been hit hard over the past year as the market starts to price in the peak of their sales cycle. At $22.46 the company shares have fallen around 61% from their 52-week high and now trade at 6.0x P/E based on forward earnings estimates. While the company is highly cyclical being a manufacturer of high priced luxury and aspirational products, Winnebago has earned a respectable ROE of 12.3% over the past decade. With the shares now trading at a price to book value of 1.34x, this brand name manufacturer is starting to look appealing. Many readers are probably familiar with the Winnebago brand of mobile home recreational vehicles. The Company builds a wide range of quality motorhomes, travel trailers, fifth wheel products and boats, under the Winnebago, Grand Design, and Chris-Craft brands. Since being founded in Iowa in 1958, the company has grown to have sales of over $2B in fiscal year 2018 with production facilities in Iowa, Indiana, Oregon, Minnesota and Florida. The company also recently diversified their product offerings by moving into the marine industry with the 2018 purchase of Chris-Craft, one of the world’s most well-known boat brands with a heritage dating back to 1874. Winnebago’s strong operations have allowed the company to achieve average return on equity (ROE) and return on invested capital (ROIC) of 12.3% and 11.7%, respectively, over the past decade. 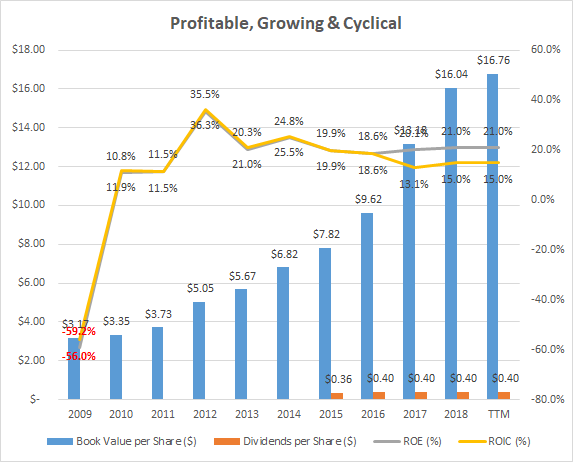 While the company is cyclical along with the industry, this average level of profitability is well above my rule of thumb of 9% ROIC, allowing me to be confident that, in my opinion, the company is able to maintain and continue to increase its intrinsic value over a business cycle. A further benefit to the company above these historical returns is the fact that being primarily a U.S. company, Winnebago recorded a tax rate of 23.3% in the fourth quarter 2018 compared to a rate of 32.3% in the prior year with the reduction related to the lower federal tax rate enacted in accordance with the Tax Cuts and Jobs Act. Also, as guided by management in the Q1 2019 conference call, the acquisition of Chris-Craft is expected to be immediately accretive to Winnebago’s Fiscal 2019 EPS if all goes to plan. As a company building high price luxury aspirational products, Winnebago’s sales are highly cyclical along with the broader economy. From 2007 to 2009, the company saw their sales fall around 75% from $870M in 2007 to $212M in 2009. This large decline resulted in the dramatic 59.2% negative return on equity in 2009 as seen in the previous graph because the business is exposed to large fixed costs as a manufacturer. This is one of the most cyclical businesses I have ever seen. But that being said, in my opinion, Winnebago still earns an ROIC that meets my minimum requirement. With a brand that has been around pretty much since cars advanced to luxury camping, and buying one of the most quintessential boat brands, this company and its brands are probably here to stay. Winnebago currently looks to be in a strong financial position with the company less financially leveraged than at the beginning of the decade when they had to deal with the fallout from the financial crisis. With financial leverage currently at 1.85x and its interest coverage ratio a healthy 9.0x in the trailing twelve month period, the company looks ready to handle the next cyclical downturn. This is the kind of low leverage that I like to see in a cyclical business. 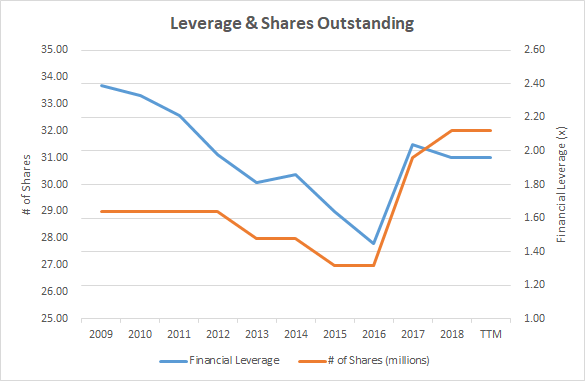 With leverage looking conservative, I would now like to see management start to redirect excess cash flow to shareholders through higher dividends or share repurchases. Any more acquisitions from the company would put me on alert as Winnebago has yet to fully digest their 2018 purchase of Chris-Craft and they should work on cementing the strong brands the company already has. At first glance, Winnebago’s current annualized dividend rate of $0.44 per share represents an increase of 10% over the annual dividend of $0.40 paid in FY 2018. However, after cutting its dividend to zero from $0.48 in 2008, the company only started paying a dividend again in 2015. With EPS of $3.22 over the trailing twelve month period, the current $0.44 annualized dividend seems to represents a negligible 13.7% payout but this is only the case if consumer spending does not deteriorate dramatically pulling profits down along with it. I always like to examine the relationship between average ROE and price-to-book value. This relationship is especially important for cyclical companies which are more profitable in the end of the cycle. This ratio is something I consider similar to Shiller’s CAPE ratio but a little simpler to calculate in my opinion. 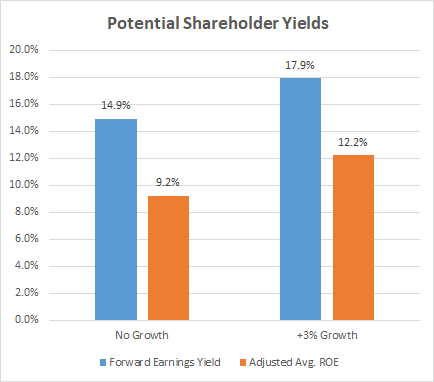 It examines the average ROE over a business cycle and adjusts that ROE for the price investors are currently paying for the company’s book value or equity per share. With Winnebago earning an average ROE of 12.3% over the past decade and the shares currently trading at a price to book value of 1.34x when the price is $22.43, this would yield an adjusted ROE of 9.2% for an investor’s equity at that purchase price, if history repeats itself. This is right around the 9% that I like to see. Even adding my maximum 3% growth rate for such a brand name, would represent long-term potential total return of an estimated 12.2%. While Winnebago is highly cyclical being a manufacturer of high priced luxury and aspirational products, the company has earned a respectable ROE and ROIC of 12.3% and 11.7% over the past decade. With financial leverage now lower than during the financial crisis, the company looks well prepared to enter the next sales decline. 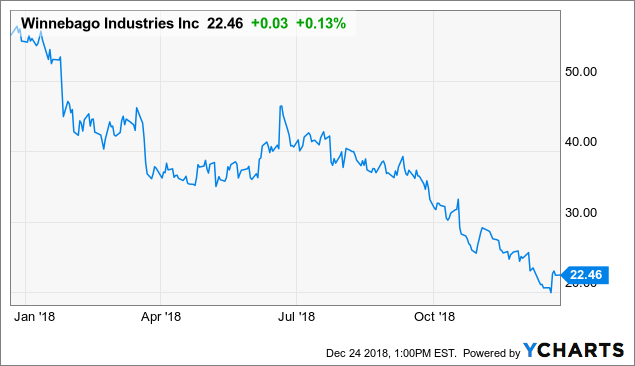 Value investors might want to put this brand name manufacturer on their watch-list as this cyclical company is getting more enticing by the day. Disclaimer: While the information and data presented in my articles are obtained from company documents and/or sources believed to be reliable, they have not been independently verified. The material is intended only as general information for your convenience and should not in any way be construed as investment advice. I advise readers to conduct their own independent research to build their own independent opinions and/or consult a qualified investment advisor before making any investment decisions. I explicitly disclaim any liability that may arise from investment decisions you make based on my articles. Disclosure: I/we have no positions in any stocks mentioned, but may initiate a long position in WGO over the next 72 hours. I wrote this article myself, and it expresses my own opinions. I am not receiving compensation for it (other than from Seeking Alpha). I have no business relationship with any company whose stock is mentioned in this article.